The look of hand painting without the mess or expense. 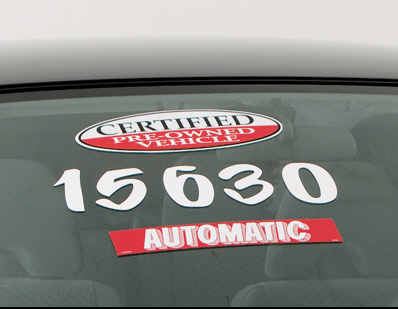 Our "Sign Painter" White die-cut adhesive windshield numbers will give your lot a clean custom painted look. An inexpensive yet highly effective sales tool to advertise a year model or price. Produced on heavy-duty vinyl for easy application. Size: 6" tall x 4" wide. Neatly shrink wrapped in packs of a dozen with a chipboard backer to prevent curling during storage. Made of durable, waterproof vinyl, these numbers demand attention! Removable adhesive allows easy, clean removal. The waterproof vinyl die cut numbers are slit on the back for easy application and are shrink wrapped and sold by the dozen. Numbers are 6 inches tall x 4 inches wide. Sold in packs of 12 numbers per pack, all same number.